Little Weirdos: Mini figures and other monster toys: Wacki Balls: Crazy Madballs knockoff keychains! 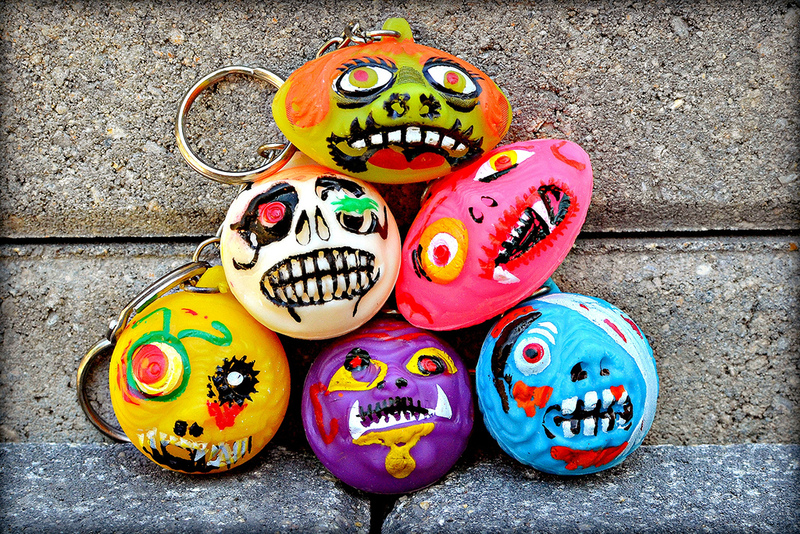 Wacki Balls: Crazy Madballs knockoff keychains! I continue to be amazed by the information that can be found online. You see that white, skull-like monster ball keychain in the photo above? I had that guy since the '80s, and never knew anything about it or saw any others of its kind. I always just assumed it was a random, nameless knockoff. Well, I was wrong, because I recently learned it was part of a set of six and that the set is named "Wacki Balls"! Thanks to an Instagram post by monster ball collector gutterutter, I discovered not only those details, but also that sets of Wacki Balls were up for sale on eBay. Of course, I jumped all over it. Who knows when these things will come up for sale again? Plus, it was time my weirdo was reunited with his family. Wacki Balls are indeed wacky. In fact, they're so wacky that whoever produced these had to misspell "wacky" to properly convey their level of wackiness. For me, there are a couple things that make them so bizarre--even when compared with most other Madballs knockoffs. 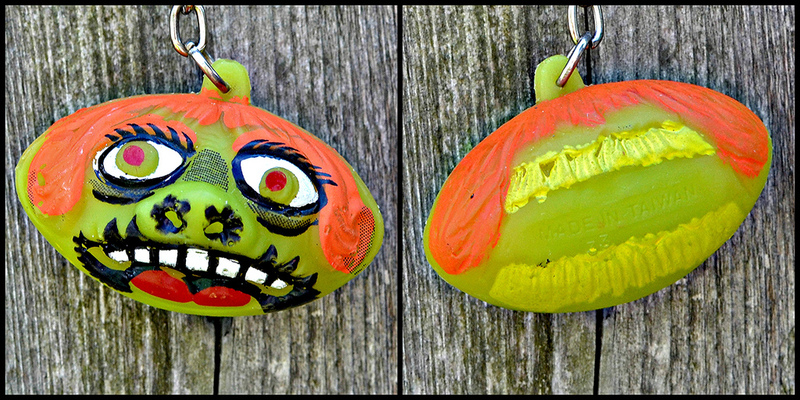 First, their unusually bright, cheerful colors belie their monstrous features and overall grossness. Second, their expressions are extra crazy. They look like a combination of pitiful despair and complete mania. I love it! I also just discovered that Wacki Balls existed in larger, typical Madball-sized form! 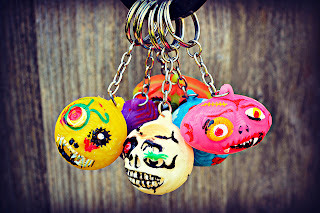 As detailed in this post over at monster ball-themed blog Blarghhhspot, each of the Wacki Balls mini keychain gang also has a regular-sized, foam ball counterpart. Apparently, a company named Lucky Star made them in 1986, so I'd imagine they also made the keychains simultaneously, but who knows. Obviously, the mini keychains are a lot less detailed than the standard Wacki Balls, but the character names and base colors are the same. 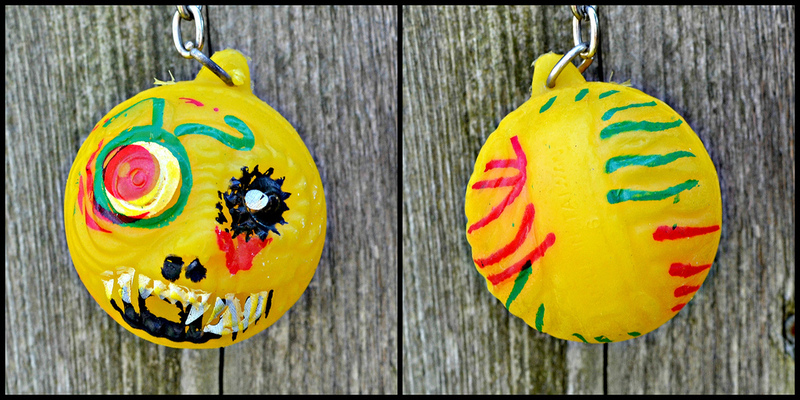 Here we have the yellow Wacki Ball, Lizard Breath. I don't really get "lizard" from looking at this dude, but whatever. I think the green around bulging eye is supposed to be worms or snakes or something, but it really forces you to use your imagination. I like the fangy mess going around in the mouth area. 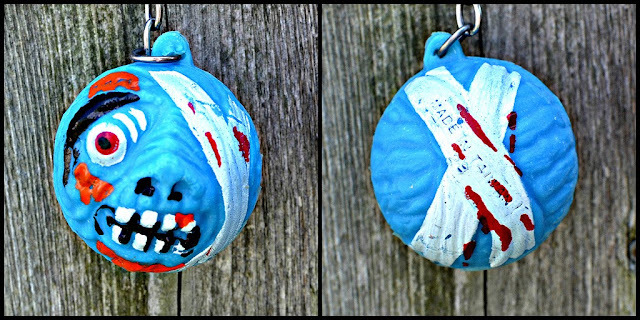 At first I thought blue Wacki Ball Stevie Slimeball was supposed to be a mummy, but now I think he might just be an injured sad sack trying to stop the left side of his face from bleeding out. I don't know, but he's pretty cool. The paint job on this one actually makes more sense than what we see on some of the others (look at the yellow weirdo above for exhibit A). In Wacki Ball land I actually don't know if that's a good or bad thing, but in any case Stevie is one of my favorites. 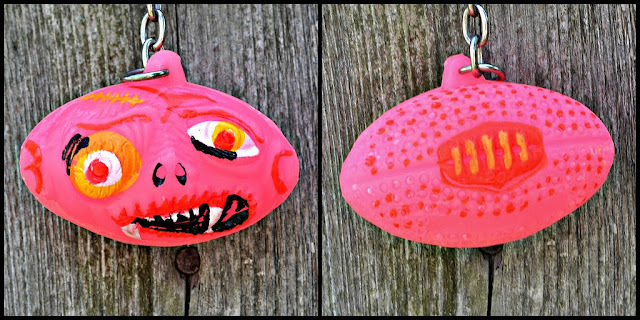 Pink Wacki Ball Mud Brain is my favorite. He's one of the two football-shaped characters in the set. I like that he's a crazy bright shade of pink, and also how expressive he is. Dude looks like he's in a really bad way. Or incredibly confused. 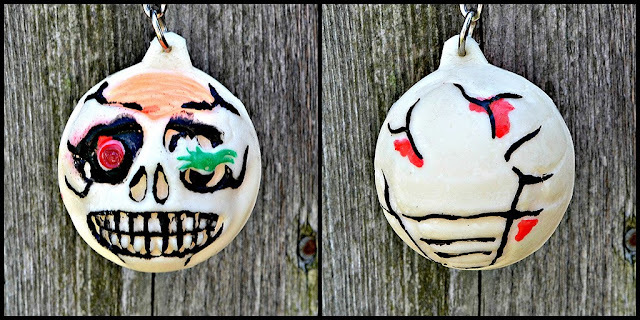 He's probably the best example of how even though the paint jobs on these are crude and sloppy, they add to the Wacki Balls' charm. As I mentioned, white skull-themed Wacki Ball Mind Stein is the one I got as a kid. So I might be a little biased, but I think he's one of the best of the set. I like how the black painted details of the face really pop against the white color. And also that he's got a spider coming out of his eye, even though it might first appear to be just a green blob. I don't know what the hell's going on here. 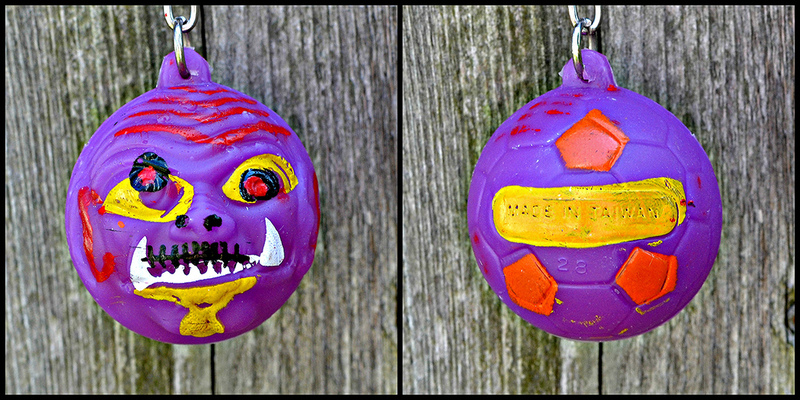 Purple Wacki Ball Wrinkle Wart might be the oddest of the set. His right eyeball can't decide if it wants to be in his eye socket or on his forehead. I'm assuming it wasn't this way on all of them and I just got an extra sloppy one, but it still makes me laugh. Also, I'm trying to figure out his mouth area. There's fangs, but then it also looks like his mouth was stitched shut. It appears like he might be a soccer ball, and they randomly decided to paint a few of the sections orange. Mr. Wart is really out there! Finally, we have green Wacki Ball Black Jack the Overtaker, the other football-shaped character of the set. Apparently his thing is that he's hairy. He's got a big ol' pile of red hair. I was trying to figure out why they called him Black Jack the Overtaker, but then I realized that I shouldn't really be trying to make sense of any of this. In the Blarghhhspot post I linked above, you can see that the package of the regular-sized Wacki Balls said of this guy, "Hide from this hairball or he'll toss you like fresh salad." Yikes. And there you have it. 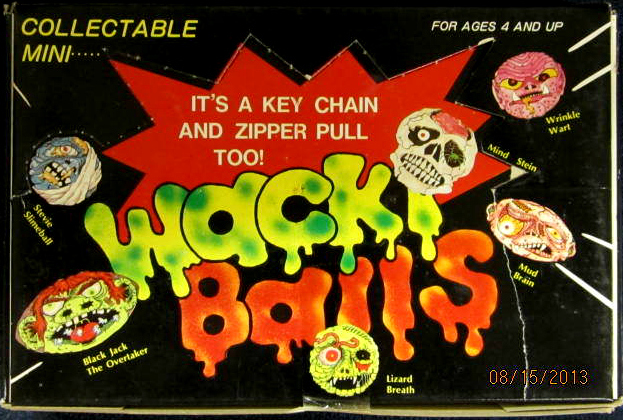 Wacki Balls, another obscurity from the land of little weirdos. What do you think of these crazy keychains? Have you ever come across any?